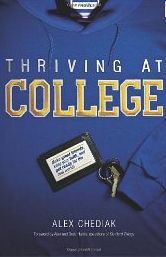 In Thriving at college, Alex Chediak tries to help equip Christian students with strategies to not only do well academically at college, but to develop good friendships, maintain a healthy spiritual life and end up well positioned to enter post-college life. I was quite impressed with this book. It deals very well with many of the things I have seen myself and my fellow students growth through or come unstuck from. One thing I particularly appreciated about this book was that they were clear about the spiritual challenges of the college environment without making college sound like the massive anti-Christian conspiracy to bring Christian students undone I have sometimes heard. The selection on the impact of how well you choose your friends alone would make reading the book worthwhile. Unless the friends are particularly wild it isn't something we tend to think about I've come to realise in my time at college how much of a difference it really does make. In addition to dealing with spiritual matters the book has a lot of good material about other aspects of college life such as debt, having an appropriate attitude about grades, getting involved in extra-curricular activities, time management and choosing a minor. The author did a good job of providing balanced advice, particularly in regards to thinking about grades in a way that takes achievement seriously without letting it become an unbalanced obsession. The book does have an American bent to its content, but it would still mostly be useful to students everywhere. I think this is a very useful and helpful book. I would happily give this to any Christian I knew who was starting college or who had been at college for a while and was struggling. I think if you were to take on the advice in this book you would have a very good chance of thriving at college. Review copy courtesy of Tyndale blog network.